•Project description of term on the board or read aloud to student, slides 2-34 EVEN only. 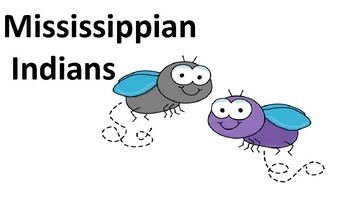 •Students will race to see who hits the correct term with the fly swatter first. SS8H1 Evaluate the impact of European exploration and settlement on American Indians in Georgia. a. 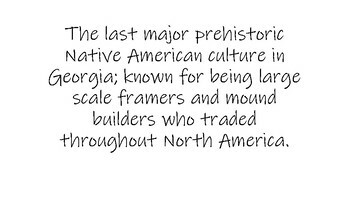 Describe the characteristics of American Indians living in Georgia at the time of European contact; to include culture, food, weapons/tools, and shelter. b. Explain reasons for European exploration and settlement of North America, with emphasis on the interests of the Spanish and British in the Southeastern area. 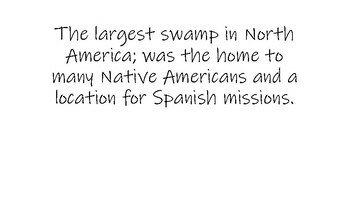 c. Evaluate the impact of Spanish contact on American Indians, including the explorations of Hernando DeSoto and the establishment of Spanish missions along the barrier islands. SS8H2 Analyze the colonial period of Georgia’s history. a. Explain the importance of the Charter of 1732, including the reasons for settlement (philanthropy, economics, and defense). b. Analyze the relationship between James Oglethorpe, Tomochichi, and Mary Musgrove in establishing the city of Savannah at Yamacraw Bluff. c. Evaluate the role of diverse groups (Jews, Salzburgers, Highland Scots, and Malcontents) in settling Georgia during the Trustee Period. d. Explain the transition of Georgia into a royal colony with regard to land ownership, slavery, alcohol, and government. e. Give examples of the kinds of goods and services produced and traded in colonial Georgia. See video, click here, for demonstration of how the game is to be setup and played.